LACOMBE, La. 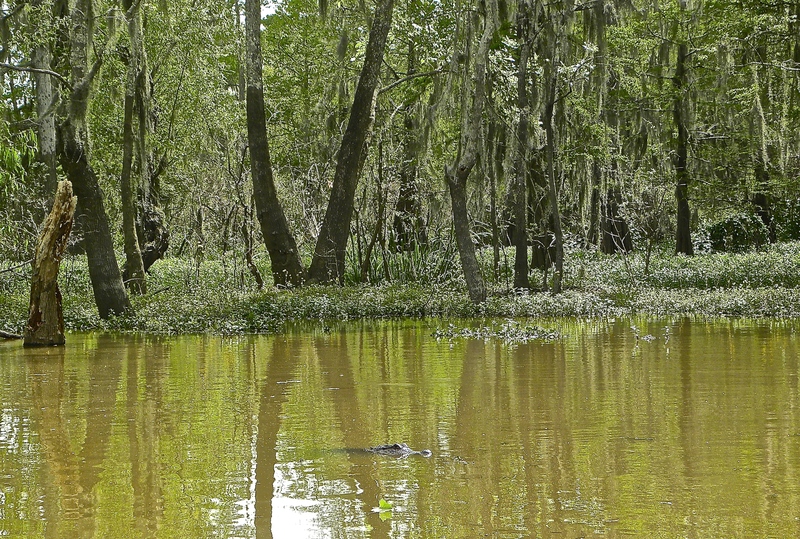 – While time on the water – fishing, boating, paddling, gaping at ‘gators and birds – is a constant theme in southern Louisiana, the serendipity of life, and the celebration of food, hover in the background. But not too far back. Driving away from prime destination New Orleans increases your chances of happening upon down-home people in the same time zone as, but half a world away from, the Big Easy’s liquor-infused gaiety. Renaissance woman Shannon Villemarette outside her bait shop/courtroom. 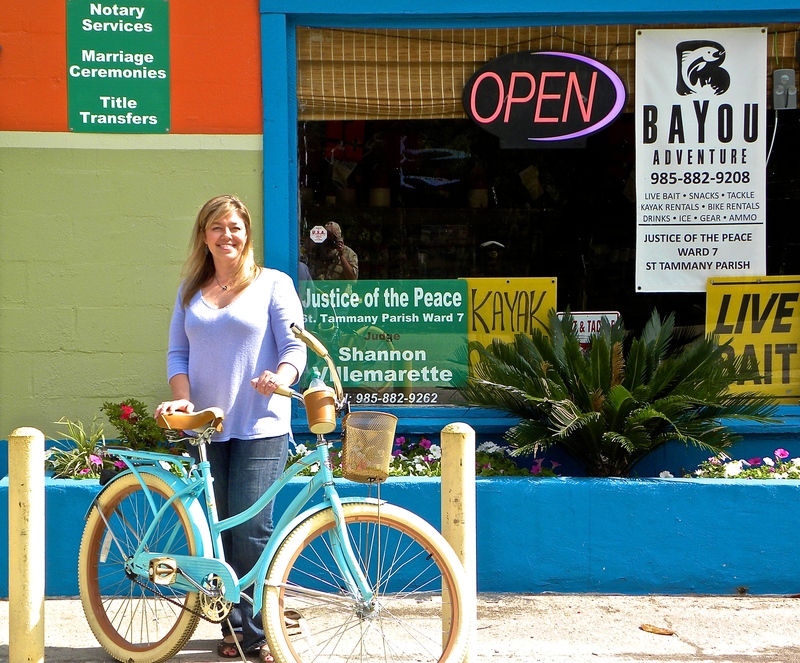 Shannon – get used to calling everyone by their first name — means running the store, renting kayaks and bicycles, hiring out as a fishing guide. She had rallied residents of this area by Lake Pontchartrain, north of New Orleans, to protest possible pollution of nearby bayous that writhe through the lowlands until merging near this village. “But there was no way to get people who didn’t own boats on to the bayous, no outfitters,’’ she continues. “Coincidentally, about then I saw an ad in the paper for a bait shop for sale. I drove up, offered the owner $100 cash (as a binder) and he threw me the keys and walked out the door. Shannon leads me back to her office — within, but walled off from, the bait shop. I’m now standing in the State of Louisiana, Parish of St. Tammany, Seventh Ward Justice Court. Judge Shannon Villemarette presiding. She laughs when I ask if she had to sling mud to get elected to the $560-a-month office. “On social media there were these anonymous posts: “Don’t vote for the hoochie in the bait ship – she wears Daisy Dukes every day’. “That brought a bunch of guys in to check me out, but I don’t own any Daisy Dukes,’’ says Her Honor, now wearing a pale lavender top and faded jeans. She then closes her chambers so we can pedal her rental bikes along the tree-shaded Tammany Trace Bike Trail. We pause while a boat loaded with fishing traps passes through a raised drawbridge on the trail. More serendipity, because it gives Shannon time to consider life here. “There are all these little charms. People enjoy meeting people, everyone’s laidback, we have blueberry farms, a winery, recreation areas like these. The passengers chuckle. Jack has set them up perfectly for his next line. He erupts in a laugh, shared by all of his customers except for the young couple from Germany, apparently not familiar with Baptists’ abstention. Twice a day, the captain narrates a 2 ½-hour tour of the vast body of water and swamp that is the Atchafalaya (cq) (pronounced at-CHUH-fuh-LIE-uh) Basin. It’s huge — roughly 140 miles long and encompassing 931 square miles. 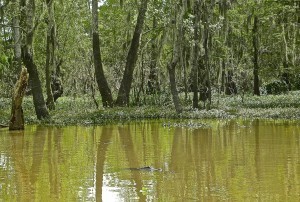 It teems with alligators, 90 species of fish, innumerable waterfowl and raptors. On this trip, the passengers gasp at the squadron of five bald eagles overhead. Then the two boaters idle engines to chat. Sometimes they do know each other, exchange gossip. Serendipity. MORGAN CITY – Less than 7 miles from Captain Jack’s dock, Ivy St. Romain’s hands flash across the table top, threading onto a thin metal rod tiny plastic beads, a tear-drop-shaped piece of shiny metal, and brightly colored silicon strands. He bends the rod into a right angle and at the other end he adds a tiny swivel, then a fishing hook. Ivy has created a fishing lure. But it’s just busy work for the owner of Blu (cq) Rebel Charters & Guide Services: Ivy is in his tackle shop, riding out a ferocious thunderstorm that has negated our plans to fish a nearby lake or the Gulf of Mexico, 26 miles from Morgan City. After he quit 30 years of inspecting pipeline welds in western Africa, South America and the Caribbean, Ivy got his captain’s license so he could pretend to “work’’ at his first love – fishing. Now he heads out on charters at least three times a week in the summer. For the umpteenth time during a half-hour interview, Ivy moves his hand just a few inches to grasp his cellphone. It’s another customer, asking about a particular lure. If the buyer doesn’t see what he wants in the shop, Ivy will pull out trays of components and on a burgundy cloth, he will arrange pieces from the trays until the customer is satisfied. In less than three minutes, the angler can have a custom-made lure. And that bit of serendipity will cost the buyer $6.99. “If you want country cooking, come to the country … Come visit us, say hey to Joan’’. Owner/operator Joan Suire (pronounced sweer) is likely to say “hey’’ first, as she greets shoppers, works the take-out counter and waits on tables on the restaurant side of this old building with wooden floors. 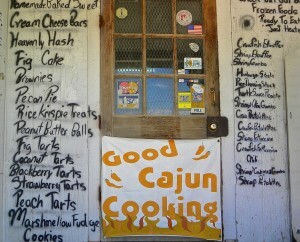 Even before you’ve taken the three steps onto the porch, you can read the menu: It’s painted around the doorframe. 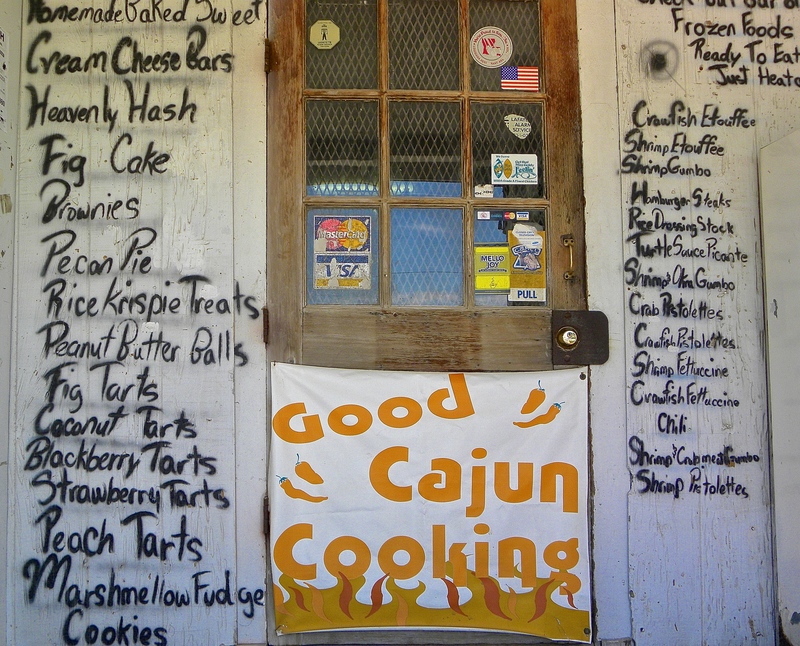 Specialties range from crawfish etouffee (spicy) and shrimp fettuccine (creamy, of course) to alligator a variety of ways to boudin (cq) balls (a basic of Cajun meals, made with various cuts of pork, rice, chopped onions, garlic and more, then fried) and pistolettes (cq) (akin to an empanada, a roll is stuffed with spices, chopped onions, seasonings and a choice of shrimp, crawfish or crab, then it’s fried). Suire’s is at a crossroads outside teensy Kaplan; the nearest town is Abbeville, pop. 13,000. “Dining’’ in Abbeville centers around Dupuy’s, opened in this location about 140 years ago to sell oysters. Between the rural atmosphere of Swuire’s and the casual in-town ambience of Dupuy’s, there is Susie’s Seafood, which lacks pretension, presentation and a website. Tables at this Morgan City eatery are covered with brown butcher paper and the napkins come off a paper-towel roll. The specialty is the crawfish boil; minimum order, four pounds. Boiled for about 10 minutes in heavily seasoned water, the crawfish go in brown and come out orange-red. Cooked with them are slices of potato and corn on the cob, which comes out tasting the spiciest. Your “basket’’ of crawfish is actually a plastic tub that the waitress dumps on the table. Then, paper towels nearby, you dig in, tearing off and discarding the crawfish heads, thin shell and legs. If you are fastidious, you might pick out the sand vein along its back. Not many dining at Susie’s slow down to do that. As the locals say: There’s three ways to become a Cajun: By the ring, by the blood, and by the back door. The longer a visitor hangs out with these Cajuns, the more that back door seems to open.